There are 3 main types of common roof flashing, Apron flashing sometimes known as cover flashing, Step flashing and Chimney flashings. 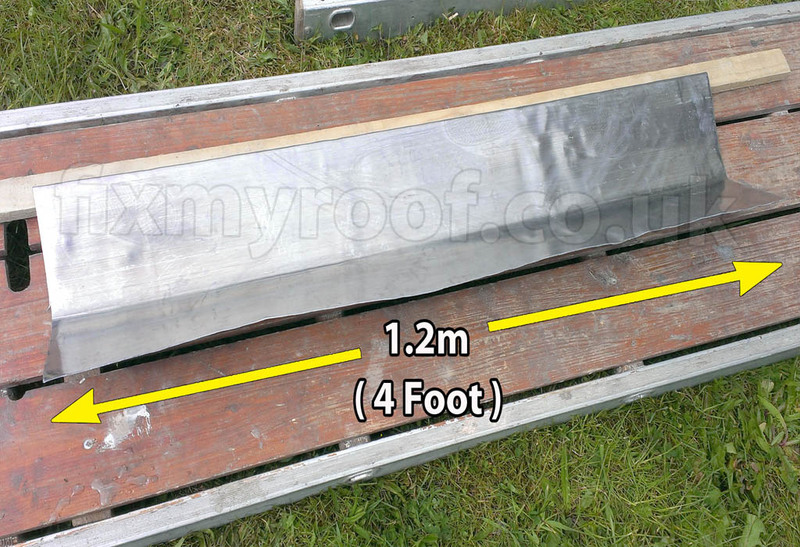 This page will teach you the basics of how to fit Apron flashings which are the most common form of roof flashing, but linked off this page I will also provide tutorials of how to fit all other common types of roof flashing as well. 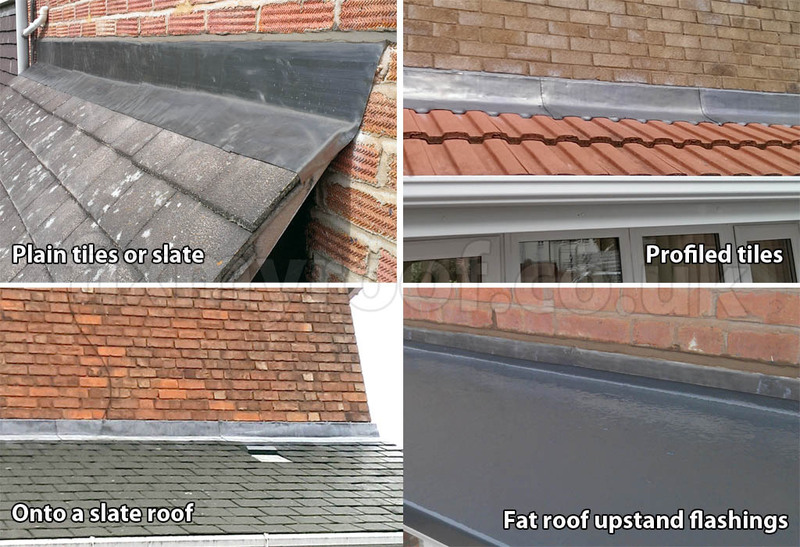 Apron flashings – If you are new to roofing or fitting roof flashings this really is a bread and butter place to start, master this and the slightly more difficult flashings like step flashings will seem a lot easier. 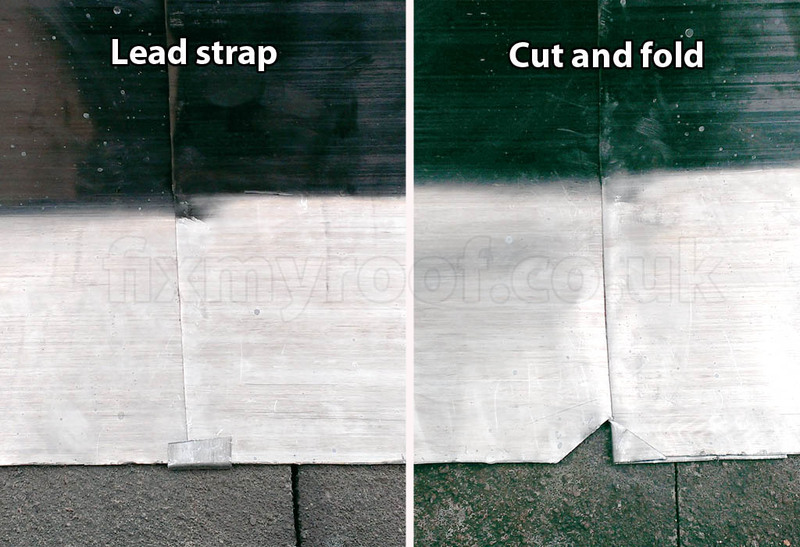 The video below will show you how to fit lead roof flashing like the ones seen in the picture above. When fitting cover flashings to a flat roof like the one pictured bottom right there is no need for the third covering angle of lead, the lead is simply cut just above the flat roof to stop capillary action and the flashing cutting into the flat roof itself. Fit roof flashings – This video shows how to install roof flashing and covers every aspect from start to finish including straps, fixing and finishing. How to point brickwork – This is a beginners guide to pointing up. Great for brickwork, chimneys or roof details like flashings. What flashing depth into a wall ? 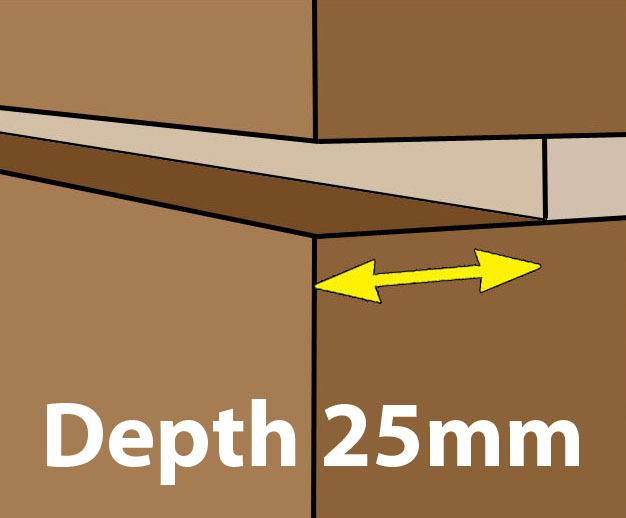 If you’re cutting a new chase into the mortar between two brickwork courses you will often see the measurement of 25mm (1″) recommended as the minimum depth for lead flashings to be set into a chase. 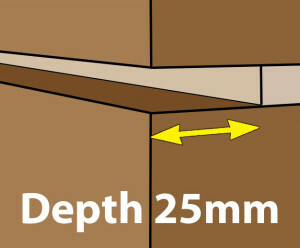 Keep in mind the depth of 25 mm is a quarter of the width of your remaining mortar. This is absolutely fine until the brickwork becomes unstable, this can happen for several reasons and must be considered before setting this as your chosen depth. Old brickwork – On old properties and chimneys the mortar can become loose or sandy, the deeper you cut the higher the likelihood of loose bricks. Windows and lintels – The strength and bond of these bricks may be compromised and can become loose easily. Shoddy bricklaying – Even on new builds I’ve known the rear unseen or unaccessible face of the brickwork to be gappy, 25mm removed from the front face may not help matters. For these reasons and more, I prefer a depth of 15 – 20mm, and if you ever renew old lead flashings, you will probably find this to be common practice amongst other roofers too. Chasing out – The process of removing the old mortar can be done with a small angle grinder with a diamond raking disc, preferably using dust extraction, or with a dedicated mortar raking tool. This is often called ‘raking out’ or ‘cutting a chase’. 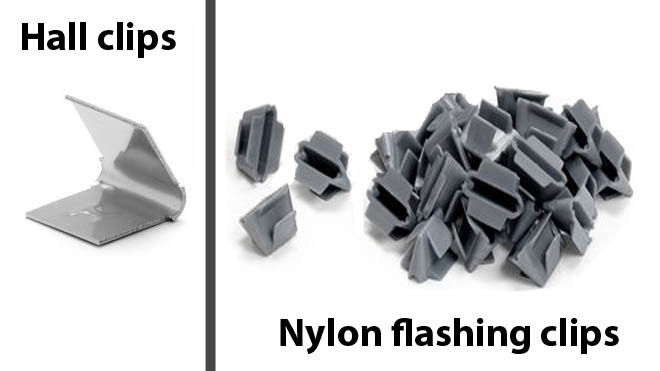 Lead over flashings as seen above are normally made from code 4 milled lead, this is recommend because it provides a good compromise between malleability (bending and working) and resistance to fatigue splits caused from expansion and contraction. Code 3 which is thinner and lighter (and cheaper) Is used for lead soakers. 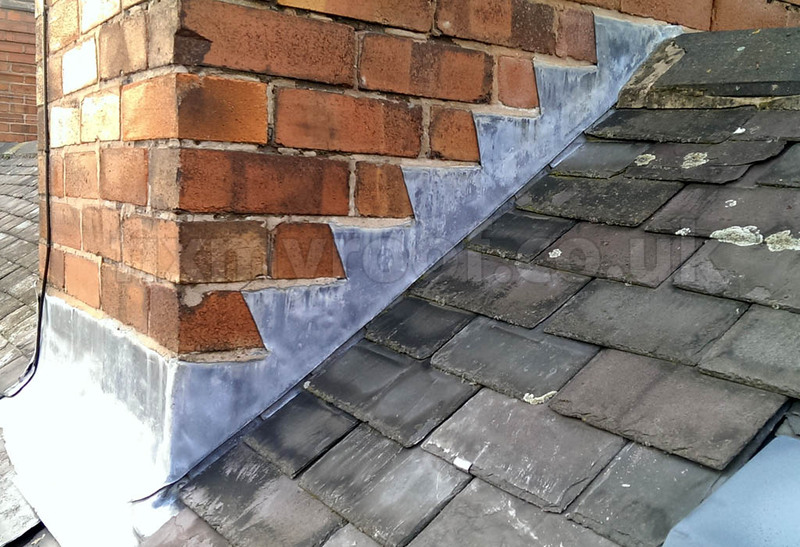 Lead soakers are the unseen waterproof sections of lead that sit underneath slates and some plain tiles, and we will see more of this in my guide to step flashings. 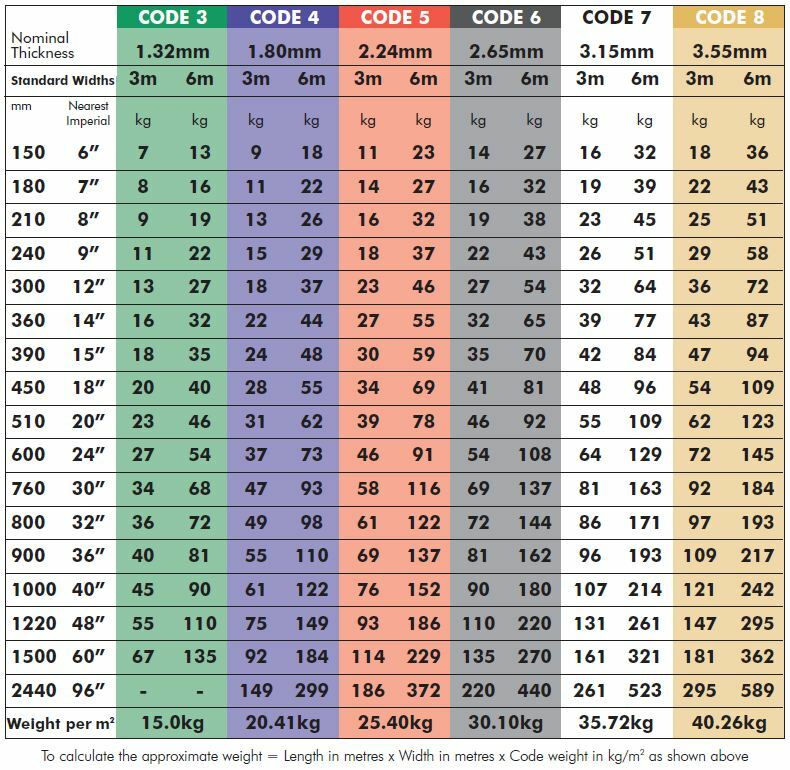 Lead code table – This chart shows common milled lead codes including weight and thicknesses. Can I use code 3 lead for flashings ? Whilst the book says no, the real answer is yes. Whilst this may have the lead snobs up in arms and make your architect choke on his biscuits, I have seen it done not only by countless roofers, but on very large complete housing estates…often. Yes, it may not last quite as long as code 4 if counted in multiple decades, but contrary to some opinion it will still last decades just as long as the sections used are not too long in length or exposed to a south facing sun trap. Whether you want to use code 3 or not is another matter. 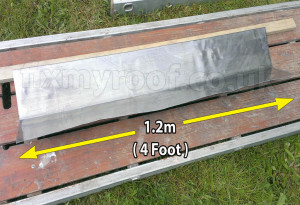 If you have any sort of pitched roof abutting a wall you will usually need 3 measurements when cutting and bending your leadwork. 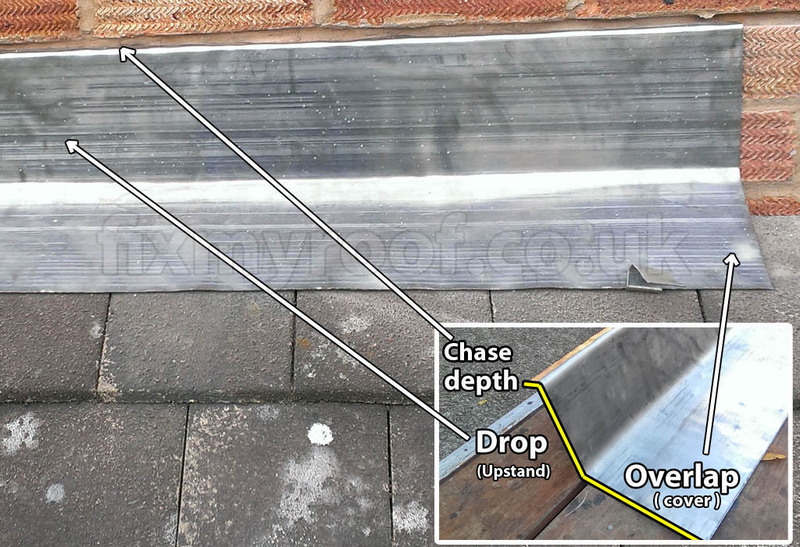 Chase depth – This is the amount of lead that pokes into the gap cut between the brickwork, normally a few mm short of bottoming out for ease of fitting. Upstand or drop – Either phrase will do, I prefer to call this the ‘ drop ‘ as sometimes a flat roof can have an ‘upstand’ that needs flashing and shouting instructions to workmates on the floor can become confusing if two things can potentially be called an upstand. 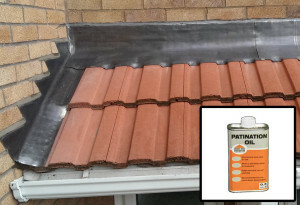 The cover – The amount of lead that covers the tiles or slates beneath to make them waterproof. Sometimes called the overlap. 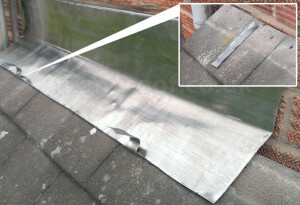 Apron flashings – These are standard lead flashings to a tiled roof or slate roof and consist of the 3 measurements as described above wherever a roof meets a wall. The height of the upstand or depth of the drop depending on how you want to label it is normally 150mm (6″) , which works out at two courses of brickwork, this can be less if you need it to be for either aesthetic reasons, or you need to fit your roof underneath a window, for instance where you may be struggling to maintain a desirable pitch on a potentially shallow roof. On an occasion where you do require to lower this to say 75mm (3″) make sure that there are no other factors like splashing from above, snow drifts or driving weather that may make this a bad idea. 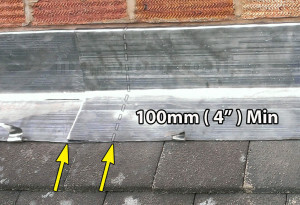 This is usually recommended to be 150mm (6″) If you are considering changing this measurement by either increasing or decreasing the overlap onto the roof, considerations have to be made again for the angle of the roof (pitch), weather exposure and aesthetics. Just like most things in life common sense is king. When fitting flashings to flat roofs no overlap onto the roof is required as the roof itself will have it’s own upstand flashing built into it. 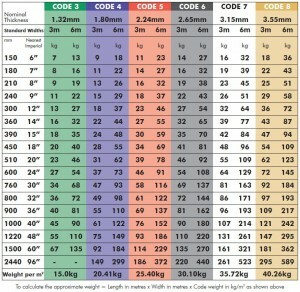 All the same rules of flashing apply except only the measurements of chase depth and drop are required. The waterproof cover is the measurement by which the upstand flashing on the roof is overlapped by the drop of the lead flashing. Flat roof flashing – This could virtually be any type of flat roof, the upstand of the flat roof covering is overlapped by the drop of the flashing. Ideally this should be 150mm or a minimum of 75mm, again common sense and exposure applies. Never cut your lead flashings longer than 1.5 metres per section (5 feet), in fact I always work with 1.2 metre lengths (4 Foot). If you cut the lead sections too long expansion and contraction will prematurely split your lead work, guaranteed. This is the number one cause of premature lead flashing failure. 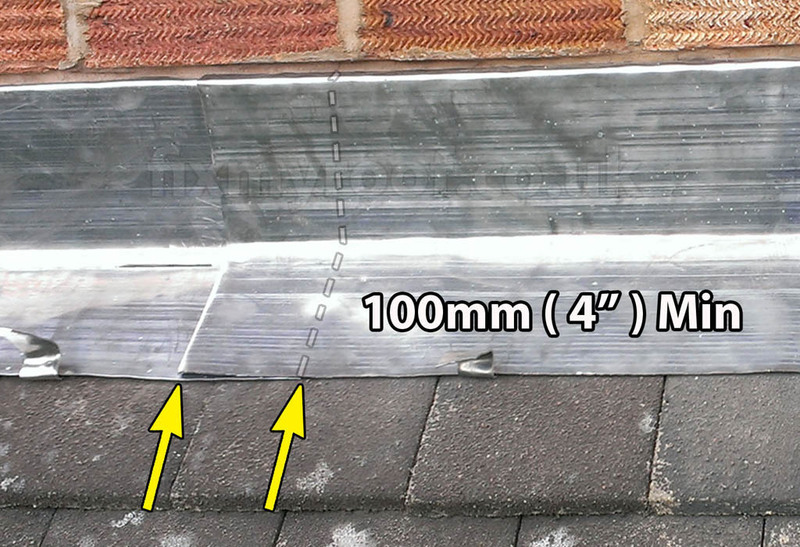 Lead flashing length – Lead does not like being long, thin and narrow. Anywhere this occurs the lead has to be sectional to allow the individual sections to expand and contract over the top of each other. This becomes very important with thin lead, and lead exposed to direct facing sunlight. Fatigue split in lead – This is exactly what you don’t want, expansion and contraction is a force of nature and has to be allowed for. South facing, a two metre length and code 3, this was asking too much. 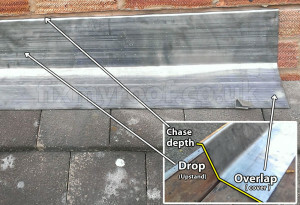 Lead flashing overlaps should be a minimum of 100mm (4″) this is a good rule of thumb unless you can see a logical reason for increasing the overlap, these reasons may include… Prevailing bad winds, exposure to direct rain strike and exceptionally high flashings where the overlap becomes vulnerable to water creep (angle of creep). 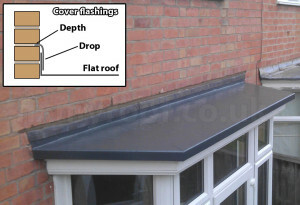 Flashing overlap – This diagram not only shows the overlap but how the flashings are installed in sections. The most common method of fixing lead flashings is to make a lead bung, also known as a lead chock. This is made by rolling up a 25mm or less strip of lead into an oval shape just wider than the mortar chase you are fixing, and then driving it below the surface of the bricks to form a wedge. Lead fixing – Always be mindful that brickwork may become unstable or crack if the lead wedge is too large for the chase. This technique may require a little practice to master but is very traditional, effective and super cheap. There are also quite a few alternatives to the traditional lead bung these days such as hall clips or similar, and nylon flashing clips. On the plus side they are easier and faster if you are installing a large run of flashings, which can be a considerable time and therefore money saver for the professional. On the downside they can be expensive compared to the free off cuts of lead you would have to hand, and may not fit large non standard brickwork chases. 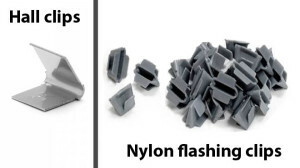 Lead flashing clips – A bag of ready made lead fixings are easier, faster and less likely to cause damage by over enthusiasm. May provide less grip in some circumstances. Sadly these are often overlooked by roofers and some lead installers, which is a shame because they cost nothing, are easy to fit, add no time to the job, and actually help the installer too. Typically made out of code 4 or 5 lead and 25 to 35mm in width, it’s simply a strip of lead that will stop lead drag and hinder wind lift. In windy or exposed areas these are sometimes upgraded to stainless steel or copper. Flashing straps – Seen here before trimming later to make the job look neat. the lead sits underneath the flashing and holds it in place, this stops gravity pulling at and distorting your nice new flashing. 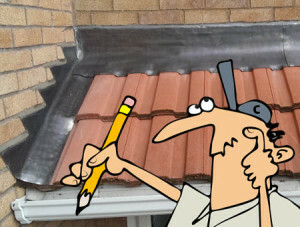 You can see instructions on this and more in my how to install lead flashings video. 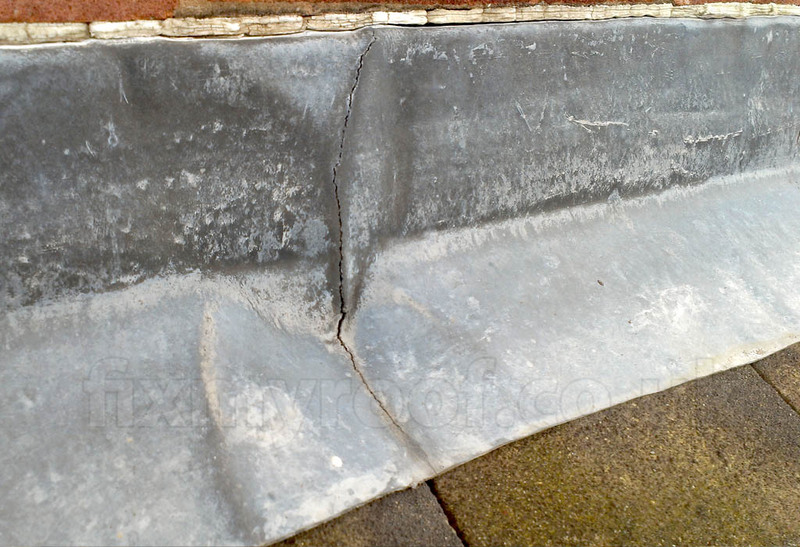 Slipped lead flashings – Yes there is a lack of fixings but the lead is also suffering from ‘ lead drag ‘ , this is where time, gravity and the weight of the lead pull the flashing away from the wall and down the roof. 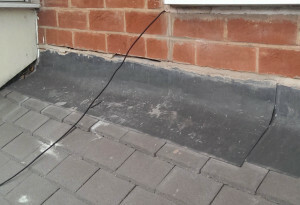 Another option after you have installed your lead strapping is to secure the overlapping lead section against wind lift with an additional step. This can be done by combining a lead strap with the overlap joint between two sections, or by making a cut and fold on the face of one flashing so that it crimps onto the other as seen below. 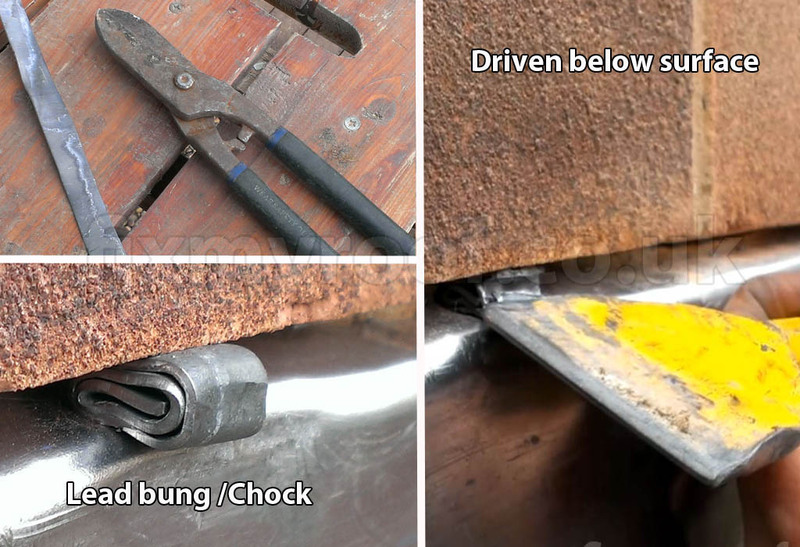 Additional measures – Here you can see how these two fixing methods work. If you are lucky enough for the lead strap to be in the correct place you can kill two birds with one stone, if not a simple cut and fold like this will get the job done. Sand and cement pointing to lead flashings or silicone mastic? Personally I like the traditional look of lead finished with mortar, you really do have to make sure that the mortar gets all the way to the back of the chase though, and this technique can be seen in my video. Over the years this has been the number one cause of lead flashing leaks that I have been called out to fix. If you are using a standard silicone make sure that it’s OK to use with lead as some types can react to lead adversely over time, better to use a dedicated lead flashing sealant like Everbuild Lead Mate – Flash mate, Soudalead, or any of the other specialised sealers. Not only will this help tone down the initial shine of new milled lead and help it colour up to that desirable new bossed lead shade, but it will also stop the awful white streaks both on your lead and anything that the rainwater will dribble onto. Don’t forget to shake well before use, and cover all the lead, as well as underneath any lead folds or straps. Patination oil is so cheap it’s a shame not too. Patination oil on lead – This picture shows the immediate effect Patination oil will have shortly after being applied, in a few months it will look superb. I quite like the Everbuild patination oil as it’s relatively cheap and still a good product. How to mix cement – A small mix for your new flashings?